A trip down memory lane… – Beauty, for good. So, today is Monday, which is usually a posting day for me, but I’m taking a bit of a break from beauty-related posts because… today is my 2nd wedding anniversary! I thought I’d take this opportunity to wander down memory lane and share some highlights from one of my favorite days ever. I love this shot of our hands as we exchanged rings. The watch my soon-to-be-hubs is wearing was my wedding gift to him. The rings I’m wearing are both heirlooms. One of each of my grandmas. I wear the multi-stone one every day. It was my Grandma Gloria’s, originally a mother’s ring, but she had that light pink stone added when I was born. The all purple one was my Grandma Marian’s. It’s actually my mom’s, so it also counted as my something borrowed ❤️ Aaron and I (Yes, that’s right, Aaron and Sharon, we rhyme.) met in NYC and that’s where we got married! This, and all these gorgeous shots were taken by our fabulous photographer, Wind Catcher Photography. In keeping with the NYC theme, we labeled each of our tables with an NYC landmark… gone, but not forgotten. We were married in a loft space, so we had to bring in everything ourselves. Which we turned out to be happy about because we could really make it our own. We were so blessed to have one of our favorite restaurants in the city cater our wedding, and then we had to have NYC’s own Doughnut Plant doughnuts for dessert! Since we weren’t having wedding cake, we also got those pretty wedding cake cookies from Baking for Good. They donate a portion of their profits to a charity-type of your choice. Bet you won’t be too surprised to find out we went with ‘animal-related’ 🐶😍🐰. 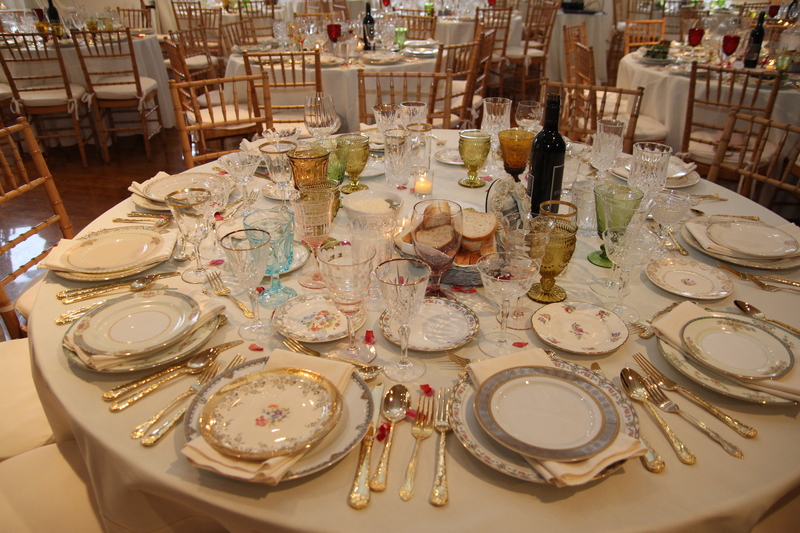 I was also amazed to find a local business that rents vintage china, we were thrilled with how lovely and unique our tables looked thanks to them! Here we are during our first dance. Man, did I love that dress. And, that man, of course. I’d always dreamed of being married in Vera Wang, and I was! My gown was from the Vera Wang White Collection for David’s Bridal. Once I tried that baby on, there was nothing else that even came close.